Competitively priced and highly practical, our collection of Indesit fridges presents a diverse range of simple, stylish and energy-efficient fridges. The Indesit fridge range encompasses compact undercounter models and tall fridges, so whatever you're looking for you'll find an Indesit fridge that does the job at a very reasonable price. 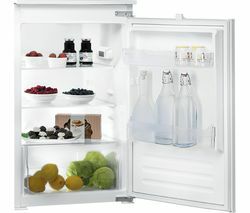 The A+ rated DLAA50 Undercounter Fridge has attracted plenty of positive feedback and it's easy to see why. Like all our Indesit fridges, the DLAA50 does a great job of covering all the key functions – substantial storage capacity (much of it customisable), effective auto-defrost technology and minimal fuss. 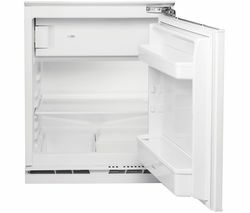 Simply put, this stalwart fridge does everything you want it to at a very reasonable price. The SI61W Tall Fridge does a very similar job in a taller form, storing your food in optimum conditions and utilising low-frost technology to minimise frost and maximise space for your groceries. Anti-bacterial coating, which is applied to the walls of the SI61W, is another stand out feature, ensuring the inside of your fridge remains clean, fresh and free of bacteria. This capacious fridge also comes with a 10-year parts guarantee, giving you extra peace of mind, and an A+ rating for efficiency, ensuring it uses much less electricity than a similar but older appliance. So, if you're upgrading from an older fridge you can expect reduced bills alongside enhanced refrigeration. Whether you're looking for a compact undercounter fridge or something a bit more substantial, Indesit fridges offer a brilliant value-for-money option that can save on energy while keeping your food in optimal conditions. Browse our refrigeration department to explore all the latest fridges from market-leading brands. Our collection includes an extensive range of Bosch fridge freezers alongside the latest LEC, Miele, Hotpoint and Liebherr fridge freezers.